Sacramento, Calif., Police Chief Daniel Hahn addresses the press at a news conference on March 27, 2018. 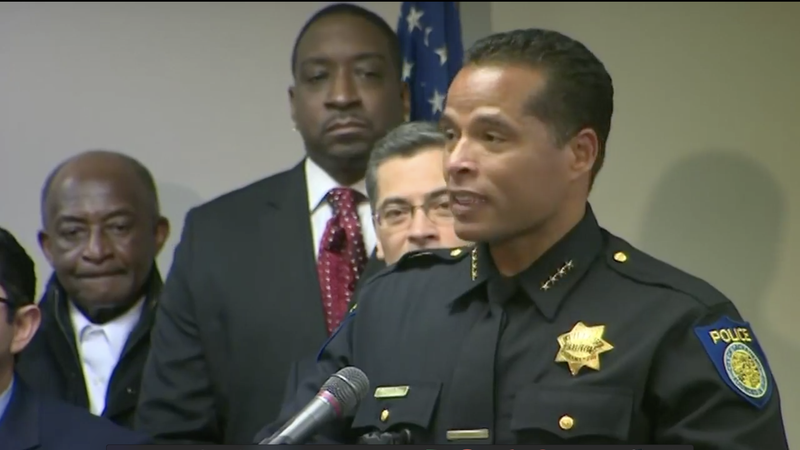 On Tuesday morning, California Attorney General Xavier Becerra and Sacramento, Calif., Police Chief Daniel Hahn, Mayor Darrell Steinberg and District Attorney Anne Marie Schubert were joined by other city officials and community leaders at a press conference addressing the officer-involved shooting that led to the death of Stephon Clark on March 18. “Today is all about building and strengthening respect and trust between our communities and law enforcement individuals,” Becerra said before turning the mic over to Hahn. “On March 18, our city experienced a tragedy that no one wants to see or experience,” Hahn said. “As our city’s police chief—who has lived in this community my entire life—I am dedicated to making sure that we gather all the facts, conduct a thorough investigation, and promise we will continue to be transparent throughout the process. “Our community deserves nothing less,” Hahn added. Hahn explained that regardless of the outcome of the investigation, his promise is to explore and implement ways for the department to better serve the community and find ways to prevent a tragedy like what happened to Clark from happening in the city again. Hahn announced that the California Department of Justice will be involved in the investigation into the shooting of Clark. “I have complete confidence in the detectives in my department to accurately and impartially and thoroughly investigate this tragic incident, but due to the nature of this investigation—the extremely high emotions, anger and hurt in our city—I felt it was in the best interest of our entire community, including the members of our police department, to ask the attorney general to be an independent part of this investigation,” Hahn said. The investigation will include an independent review of the Sacramento Police Department’s policies and training as they relate to use of force. Hahn said the city is “at a critical point right now,” and he hoped that the state Justice Department’s involvement would help build faith and confidence that the investigation will be handled properly. Hahn pleaded with the community to exercise calm in the coming months, referencing the numerous protests that have taken place in Sacramento since the shooting occurred. Becerra was asked if there should be a protocol put in place to have independent investigations of all officer-involved shootings throughout the state. He deflected and said that the focus should be on this current situation and the shooting of Stephon Clark. When asked if the names of the officers involved would be released to the public, Hahn said that the names “are already out there” but added that the department has not confirmed their identities out of concern for their safety. The officers have been receiving death threats since the shooting occurred. Becerra stressed that the independent investigation is an attempt not to undermine local authority but, rather, to provide an independent arm to the local investigation. Becerra said that he has independent authority to consider prosecution, but Schubert retains authority to determine whether or not charges will be brought against the officers. The city’s district attorney said that she welcomed the independent review by the attorney general. She was asked about her record on not prosecuting police officers in shootings—with a specific reference to the Joseph Mann shooting—but before she could answer, Becerra guided the conversation away from that, saying that he wanted to keep the questions specific to the current shooting investigation. Hahn was asked if pursuing someone who was suspected of breaking windows with guns drawn was appropriate, and he said that is exactly what the investigation is meant to determine. So the takeaway is that the investigation will likely be long and probably won’t provide immediate answers or charges against the officers involved. We will be waiting for justice, but once again, it is not guaranteed that we will get it.